eBook: Need to Build Within a Budget? Completing a building project within budget isn’t about simply choosing the framing materials that cost the least. 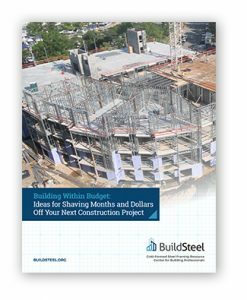 Our new eBook, “Building Within Budget: Ideas for Shaving Months and Dollars Off Your Next Construction Project,” explains why you need to consider the total cost of construction and how cold-formed steel (CFS) framing can help you meet your budget goals.